« Is Obama Really Going to Propose another Keynesian Stimulus? The Congressional Budget Office has just released the update to its Economic and Budget Outlook. This certainly doesn’t reflect well on the Obama White House, which claimed that flushing $800 billion down the Washington rathole would prevent the joblessness rate from ever climbing above 8 percent. Not that I have any faith in CBO estimates. After all, those bureaucrats still embrace Keynesian economics. But this post is not about the backwards economics at CBO. Instead, I want to look at the new budget forecast and see what degree of fiscal discipline is necessary to get rid of red ink. The first thing I did was to look at CBO’s revenue forecast, which can be found in table 1-2. But CBO assumes the 2001 and 2003 tax cuts will expire at the end of 2012, as well as other automatic tax hikes for 2013. So I went to table 1-8 and got the projections for those tax provisions and backed them out of the baseline forecast. That gave me a no-tax-hike forecast for the next 10 years, which shows that revenues will grow, on average, slightly faster than 6.6 percent annually. Or, for those who like actual numbers, revenues will climb from a bit over $2.3 trillion this year to almost $4.4 trillion in 2021. Something else we know from CBO’s budget forecast is that spending this year (fiscal year 2011) is projected to be a bit below $3.6 trillion. So if we know that tax revenues will be $4.4 trillion in 2021 (and that’s without any tax hike), and we know that spending is about $3.6 trillion today, then even those of us who hate math can probably figure out that we can balance the budget by 2021 so long as government spending does not increase by more than $800 billion during the next 10 years. Yes, you read that correctly. We can increase spending and still balance the budget. 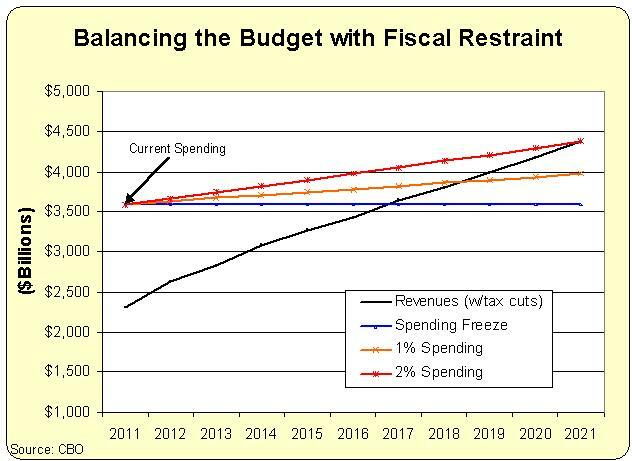 This chart shows how quickly the budget can be balanced with varying degrees of fiscal discipline. The numbers show that a spending freeze balances the budget by 2017. Red ink disappears by 2019 if spending is allowed to grow 1 percent each years. And the deficit disappears by 2021 if spending is limited to 2 percent annual growth. Not that these numbers are a surprise. I got similar results after last year’s update, and also earlier this year when the Economic and Budget Outlook was published. Some of you may be thinking this can’t possibly be right. After all, you hear politicians constantly assert that we need tax hikes because that’s the only way to balance the budget without “draconian” and “savage” budget cuts. But as I’ve explained before, this demagoguery is based on the dishonest Washington practice of assuming that spending should increase every year, and then claiming that a budget cut takes place anytime spending does not rise as fast as previously planned. In reality, balancing the budget is very simple. Modest spending restraint is all that’s needed. That doesn’t mean it’s easy, particularly in a corrupt town dominated by interest groups, lobbyists, bureaucrats, and politicians. But if we takes tax hikes off the table and somehow cap the growth of spending, it can be done. This video explains. And we know other countries have succeeded with fiscal restraint. As is explained in this video. Or we can acquiesce to the Washington establishment and raise taxes and impose fake spending cuts. But that hasn’t worked so well for Greece and other European welfare states, so I wouldn’t suggest that approach. Revenues will double ($2.3/2011 – $4.4/2021)? Well laid out argument, thanks for writing and sharing. Even if the numbers are wrong it shows what some spending restraint will do for the problem. Dan, unfortunately I can’t get the links to your videos to work, either at work or at home. Is there another format you could try that would facilitate an avid follower in remote Perth (Western Austrlia) accessing the videos? Thanks, & keep up the good work. P.S. In Austrlia we’re being governed by Fabians, who are at least as inept as your people in Washington at understanding the basics of wealth creation. P.P.S. Who said ” Democracy is the worst form of government ever conceived by mankind; except for all the others”? Dan, what is the basis of this rosy projection of 6.6% increase in collection? It doesn’t make any sense to me. Here’s why. Current GDP is $14.772T, and tax collection is around 16% of GDP, just over 2.36 T.
If we assume an annual growth rate of 2.5%, GDP by year end 2021 will be 18.9T. This is a realistic growth rate. Any higher projection above 3% is, in my view, totally unrealistic and shouldn’t even be discussed. If you think otherwise, I’d like to know why. Now, at that growth rate, if collection remains at 16% of GDP, it will reach a bit over 3T by end of 2021, nowhere near the 4.4T you quote. In order for collection to reach 4.4T as the CBO projects, at 2021 the IRS would have to collect around 23% of GDP – a totally unrealistic projection. Not only would this require a huge tax increase, it’s highly doubtful that 23% is even possible without a national VAT. US collections have NEVER reached that high, EVER. Collection at 23% is La La Land. Even if collection is at a whopping 20% of GDP, every year for the next ten years – itself highly unrealistic, in addition to the fact that this would require a massive tax increase, and assuming the Laffer effect doesn’t kick in, itself a debatable proposition – by 2021 collection will be only around 3.78B, still nowhere near CBO’s rosy projection. Currently spending is 3.7B, so even if spending is frozen at current level, and collection is shot way way up by close to 4 points of GDP to 20% of GDP, only then, at the end of 2021 we’ll be very close to a balanced budget. That’s a very different picture than the one you’re painting. That’s why I’d like to know how you got the numbers you got..